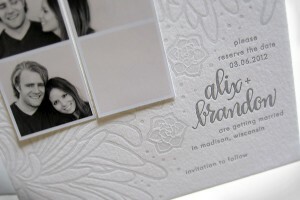 Raise Your Hand If You Love Paper (Plus, a Calligraphy Special Offer)! Like I said in my last blog post – I. love. Paper. I DO! I love everything about it. The texture. The weight. The color. 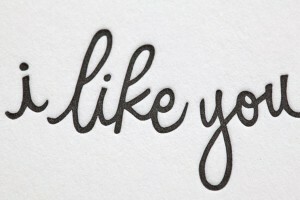 The words you find on paper. And the way those words are artfully displayed on said paper is just the icing on the cake in my book. One of my goals in 2013 is to learn the craft of calligraphy. From the time I was little, I just loved trying out “new handwriting” styles. I always felt a small sense of pride when friends would ask me to write their name in one of my cool “fonts”. 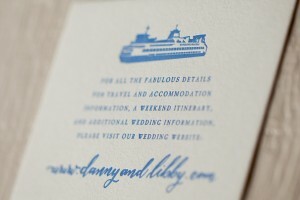 (Dork, I know…) Fast forward to my grown-up days and I still feel giddy when I come across a new style of lettering. 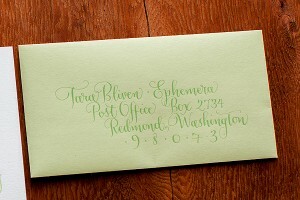 So, in honor of my calligraphy obsession, I just HAD to share this amazing special offer from Seattle-calligrapher-letterpress-extraordinaire, Tara Bliven at Ephemera. 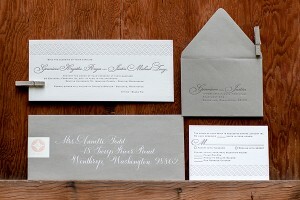 Order (or pre-order) your letterpress wedding stationary with Ephemera by Valentine’s Day and you’ll get 35 hand-addressed envelopes for FREE! More details can be found on Ephemera’s web site, but if that’s not enough to get you giddy, check out some of her show-stopping work below. Amazing, right? And why stop there! Valentine’s Day is just around the corner and Tara has a handful of fun letterpress goodies in her online shop (hint, hint, sweet husband of mine! ), so stop by and check it out.